Seeing this extraordinary documentary from AmbienTV invited me to share this article about the Andean vision, the worldview, very different from the one we have today. It is probable that some people upon seeing the documentary express themselves or think the wrong way about the grade of superstition of our population in the Andes, and some even in a derogatory way express and attribute these “behaviors” to the “delay” or “backwardness” of these populations. Those of us who have walked the punas have been surprised by the caress and form of expression of its natural resources: the water, soil, cultivation, and livestock. The cultural expression such as the patron festivities or the expressions of respect in moments of planting or harvest of its cultivations. As engineer Julio Valladolid mentioned, it is the respectful manner of perceiving nature, whose most distinctive characteristic is that of being a “nurturer” of diversity. This Andean worldview has made it possible for the farmers, the producers of the Andes, to still conserve and nurture with great affection and dedication a great diversity and variability of seeds for its feeding, nutrition, and prevention/curation of sicknesses. The modern Western culture still has its own way of relating to nature, its own worldview, but unlike the Andean worldview, it does not breed diversity, but drives uniformity and homogeneity. It constructs the homogeneity that suits the management, control, and exploitation of nature with criteria of increasingly greater production and profitability. This vision does not BREED diversity – it PROCESSES or MANAGES uniformity. The point is not to say which is better or worse, nor is it to compare, but the point is to know and understand both visions. They are two different ways of perceiving and relating oneself to nature, that a dialogue may be established, of equivalent manner, in similarity of conditions, without considering that one is better than the other. 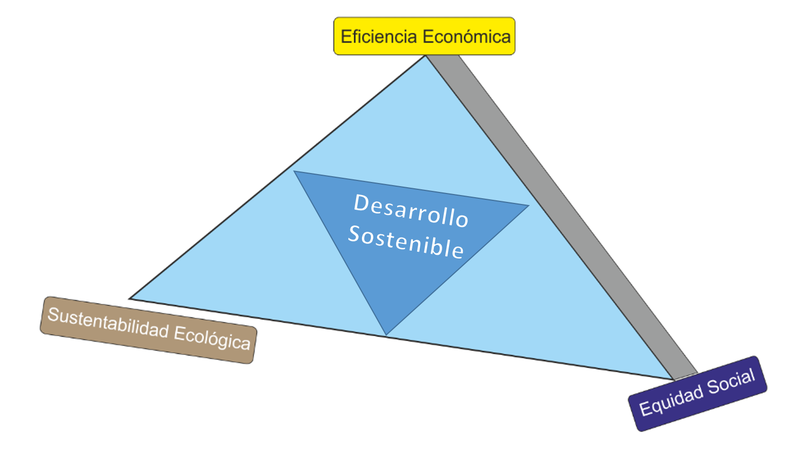 The vision of sustainable development tries to combine economic, social, and environmental aspects, seeking the equilibrium among these three fundamental aspects in order to achieve development, such as is highlighted in the widely known triangle that we show. 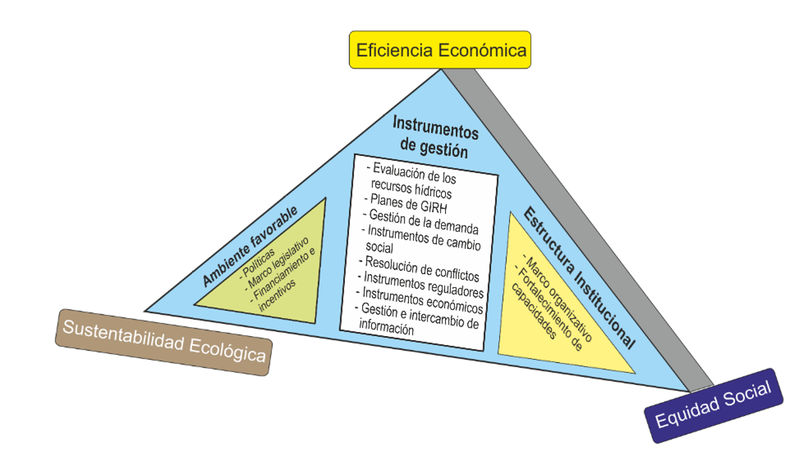 When we associate to this concept the aspect of GIRH (Gestión Integrada de Recursos Hidricos (Integrated Management of Resources)) the interior of the triangle is modified and aspects of a favorable environment (politics, legislative framework, and financing), institutional structure (organizational framework, institutional structures, and capacity-building) and management tools are added. But we point out that none of this will become truly sustainable if we do not incorporate cultural aspects. The triangle will be stable on a cultural base, where from ancestral knowledge we build our values. 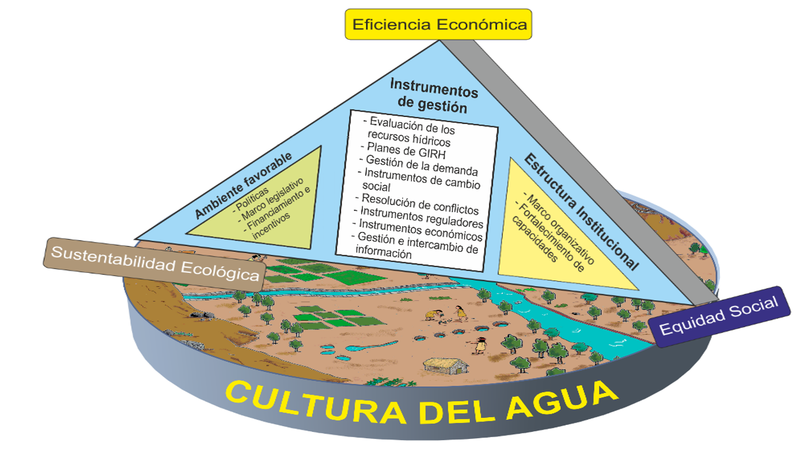 It is important to know the Andean vision, that ancestral wisdom that is in each one of the works left by our ancestors, but above all in the breeding of biodiversity and breeding of water that make our farmer in the Andes. We present a series of images taken from the book “Guide of knowledge for the Breeding of Andean Agro-Biodiversity,” by Engineer Julio Valladolid Rivera.